Is yogurt good for dogs? Can dogs safely eat yogurt? I have been out looking at human foods that are safe for dogs. It is not surprising that yogurt makes the top ten list. Below are reasons why you should you should consider yogurt for dogs. Find out how best to give special yogurt treats for dogs. We all seek to give the best to our dogs making sure they are in perfect health. That includes a well-balanced diet. We always tend to think that human food can be consumed by our dogs as much. However, not all human foods are fit for dogs. However, as most dog owners already do, you can safely give yogurt to your dog. All you need to do is choose the right type. DO NOT replace regular dog food with yogurt. Is Yogurt Good for Dogs? Is It Safe? Recently, there have been a number of studies on consumption of yogurt for probiotics. Probiotics boost the immune system and also promote a better digestive system. This has prompted questions on whether dogs can benefit in the same way. There are a number of ways in which probiotics can be introduced to the digestive system of your dog. The most common one being yogurt- an excellent natural probiotic if you do not want to use commercial products such as Purina Fortiflora. A dog with digestive problems may benefit from live bacteria such as Enterococcus and Lactobacillus found in yogurt. If you want to safely give yogurt to your dog, do a thorough research on how well he can tolerate it. A dog that has had a bad reactions to dairy in the past should not be fed on yogurt. Dogs with lactose intolerance may not react positively to addition of yogurt into their diet. Look out for past incidences of vomiting, bloating and diarrhea to rule out whether your dog can be fed on yogurt or not. If you seek to add yogurt into your dog’s menu, let your vet recommend the best type and safe ways to offer it. Yogurt is a rich source of animal protein that makes up most of your dog’s muscle bulk. It is rich in potassium which plays a key role in healthy heart function. Potassium is an essential electrolyte that maintains healthy muscles and nerves. It is also regulates fluid balance in your dog’s body. Magnesium found in yogurt helps the body to absorb essential nutrients and vitamins such as vitamin C, Phosphorus and Sodium. It is recommended that you only give unflavored plain yogurt to dogs. 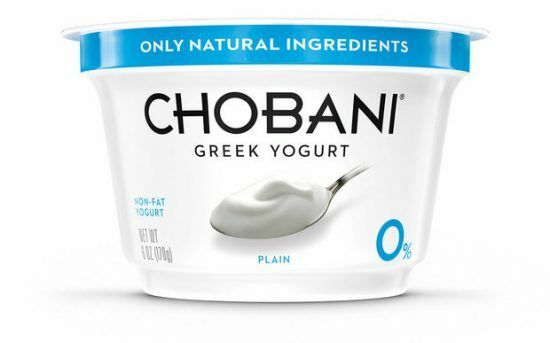 Plain yogurt does not contain food colorings and sugar additives. While additives are perfectly okay for humans, they are not safe for dog consumption. You can easily make plain yogurt full of probiotics at home. Video: Can Dogs Eat Yogurt? Just as it is for humans, dogs find yogurt creamy and delicious. Whether you simply give it as treats or as a probiotic for digestive problems. It is a rich and healthy treats for dogs. Other than being a source for probiotics, here are other nutritional benefits of yogurt for dogs. Yogurt may be a good way of repairing the digestive system after taking antibiotics. The gut is home to many different types of bacteria that help digest food and destroy pathogens. Antibiotics (especially broad spectrum) destroy bacteria indiscriminately. After antibiotics, it is best to replenish the good bacteria by giving your dog a natural probiotic such as yogurt. Wondering how to treat dog skin problems? Yogurt is a good natural remedy to soothe dry itchy skin. It is also good for rashes, hotspots and skin allergies. Yeast infection symptoms like dry skin and itchy coat can easily be managed by feeding your dog yogurt with live bacteria. Note that this is not optimal treatment but offers temporary relief. Probiotics are of great help when it comes to digestive problems. Having in mind the consequences, canine diarrhea will get you running to the vet every time your dog suffers from upset stomach. Using yogurt for dogs with diarrhea helps curb effects such as dehydration. Probiotics in yogurt are also good in fighting off bacteria that cause teeth problems in dogs. The live cultures in yogurt help prevent periodontal disease, tartar and bad breath. Just make sure that you don’t give yogurt with any added sugars. Video: Do dogs eat yogurt? 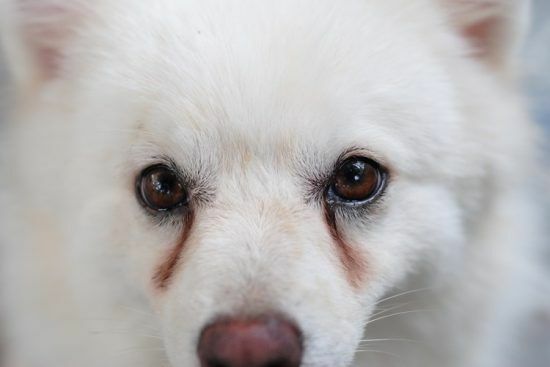 Tear staining is a common canine problem especially in old dogs and hairy types such as Maltese. This problem is usually caused by yeast infections. Give your dog a spoonful of plain yogurt twice daily. You can allow him to lick it directly from the spoon or mix it up with his food. Note that YOU SHOULD NOT put yogurt into dog eyes to help with tear staining. Give yogurt to your dog to offer relief from symptoms of urinary tract infection. Apple Cider Vinegar and Yogurt is a common home remedy for urinary tract infections in dogs. From most reviews I came across online, this remedy seems to work well for most dog owners. Simply add one tablespoon of Apple Cider Vinegar to plain yogurt. Ear infections in dogs are caused by growth of yeast. Antibiotics, wounds from scratching, moist and low immune system are the most common causes of dog ear infections due to yeast. Introducing live bacteria such as acidophilus to your dog helps with yeast infection management. You can supplement probiotics in pill form. Alternatively, you can give yogurt. Acidophilus helps maintain the right balance of normal flora in the body. It also prevents overgrowth of yeast. The goal in management of diabetes in dogs remains keeping sugars close to normal as much as possible. This helps prevent diabetic related complications such as urinary tract infections. While there is no ultimate diet for managing diabetes in dogs, vets recommend, giving low fat, high fiber diet. 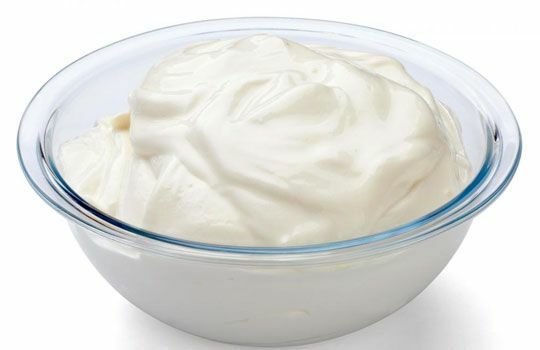 Low fat foods such as Greek Yogurt have fewer calories. This will help your dog to effectively eat less and lose weight. Greek yogurt is also rich in calcium content. Due to low immunity, dogs with cancer need special diet for faster recovery. Getting enough nutrients helps your dogs to build up enough muscle tissue giving them a better chance of fighting cancer. Yogurt makes up almost all of recommended recipes for dogs with cancer. It is also good for dogs with liver disease, pancreatitis and renal failure. Canine parvovirus is a highly contagious infections that can be easily transmitted from dog to dog. It attacks cells that reproduce rapidly such as those of the intestinal tract. Symptoms include, vomiting, diarrhea (may be bloody), fever and lethargy. Yogurt is one of the best home remedies for dogs with parvo. You can give plain unflavored yogurt to your dog once he’s able to tolerate food. Note however, that sugar can make diarrhea worse. Stay clear of flavored, fruit blended or sugar added yogurts. If your dog is not able to tolerate solid foods, dilute the yogurt with equal amounts of water. Is Yogurt Good for Nursing Dogs? Pregnant and lactating dogs have a higher nutritional requirement compared to others. The best foods for nursing dogs should have lots of calories, fat and proteins. Foods with high calcium content are essential to prevent milk fever and pre-eclampsia. Yogurt is one of the human foods approved for nursing dogs. Other foods fit for lactating and pregnant dogs include: cottage cheese, pumpkin, carrots, green beans and eggs. Giving yogurt to your puppy is as good. It helps with digestion. Just be sure to stick to plain, sugar free yogurt. Yogurt for puppies should not have added sweets or sugars as these will harm your puppy. Be sure to go for yogurt with live cultures in it. How Much Yogurt Should You Give To Your Dog? 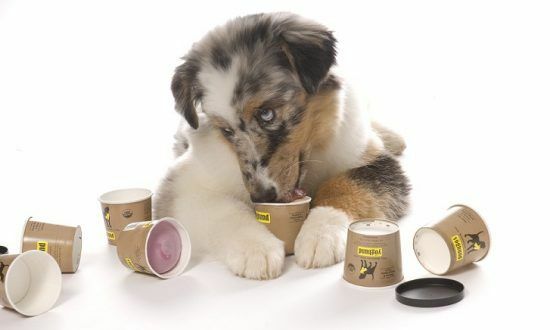 One this is for sure, yogurt is in many ways beneficial to dogs. If you are introducing yogurt to your dog, start slowly. Begin with small amounts to prevent sensitivity which presents as gas, constipation and loose stools. There is no standard dosage of yogurt for dogs. Give between a teaspoon and a tablespoonful depending on the size of your dog. Allow your dog to lick it directly from the spoon. Alternatively, mix it up with his dry food. You can buy or make yogurt coating and icing for homemade yogurt dog treats such as biscuits, cakes and cookies. A number of dog treats such as cookies, melts and popsicles have yogurt added into them. 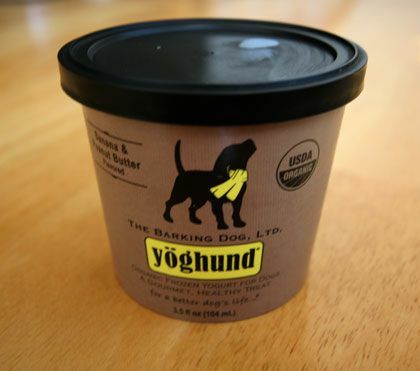 Brands such as yogund, froyo doc have yogurt specifically made for dogs. 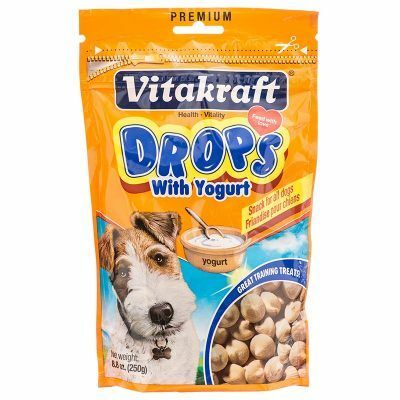 You can also buy drops or chips made with yogurt. Mix the above the ingredients in a food processor. Make patties, freeze and feed them to your dog according to their diet. Yogurt with artificial sweeteners and additives contain high amounts of sugar which are not necessarily good for your dog. Just like for any other dairy products, yogurt contains lactose. Most dogs are not able to produce enough of enzyme lactase (required to break down lactose). Other dogs are not able to produce it at all. Lactose intolerance Presents with symptoms such as diarrhea, bloating and flatulence. Yogurt contains less live bacteria. When intending to give probiotic yogurt for dogs, it may not be effective. You need to have a particular number and specific species of live bacteria reaching the intestines. It is for this reason that vets recommend giving supplements or probiotics meant for dogs. You can also give non-dairy or lactose free yogurt. Note however that sensitive dogs may still react to this. Most yogurts contain cooked bacteria rather than live bacteria. These can kill both good and bad bacteria causing even more harm to your dog. It may even be a source of recurrent yeast infections and digestive problems such as gas and colitis.